(Dan Trimmer, 1998). Tetraploid ((RUBY SPIDER X (NORDIC NIGHTS X TETRA REGAL FINALE)) This dormant 30” tall, 7 3/4” ruby red daylily has to be seen to be appreciated. Its parent, Ruby Spider, when grown into a large clump was one of the grand show stoppers in my garden last year. 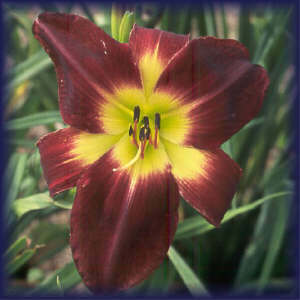 PERSIAN RUBY is also a grand garden subject, very similar to Ruby Spider, but a different color, ruby red. PERSIAN RUBY should be of great importance to the hybridizer as it is a large bloom that is quite pod fertile. In my quest for monster sized blooms I have found that generally the larger the bloom the harder it has been for me to make seed. PERSIAN RUBY is the pod parent for much of the pollen from my Tetraploid spider and long petaled program. Petals measure 4 3/4” and they often pinch. I believe PERSIAN RUBY will be the parent of exciting large spidery exotics She is well branched with the lowest branch high above the low arched dark foliage. 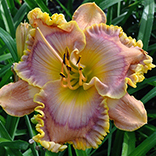 Perhaps the most striking element of this bloom is the very large green throat PERSIAN RUBY inherits from Tetra Regal Finale. I am able to introduce this cultivar before I have even seen the first offspring as it grew and increased so well. I believe this is the first introduction from the conversion of Pat Stamile’s purple Regal Finale.